Hi everyone! 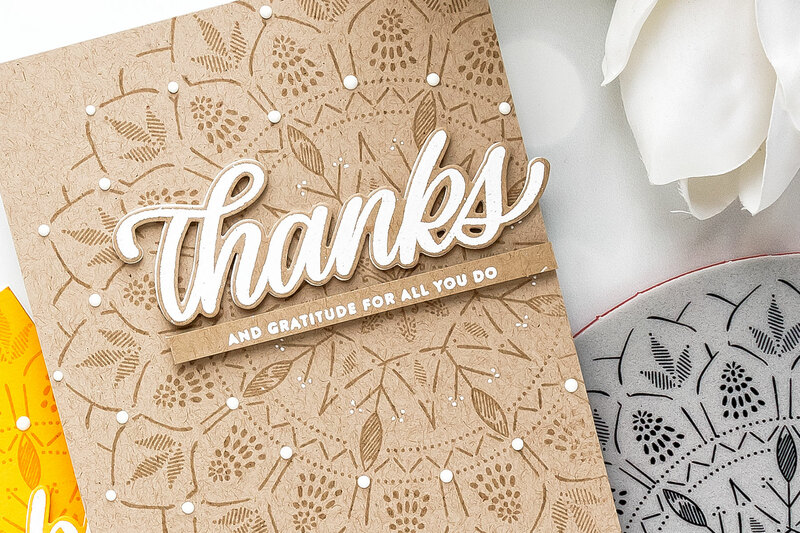 I love to use lace-like stamps for my cards because they always add beautiful and effortless elegance to my projects. So when I saw the new Bohemian Lace background stamp from Simon Says Stamp from their Sending Sunshine release I immediately wanted to play with it. I decided I’d try doing tone on tone stamping and also some heat embossing to make beautiful backgrounds for my cards. 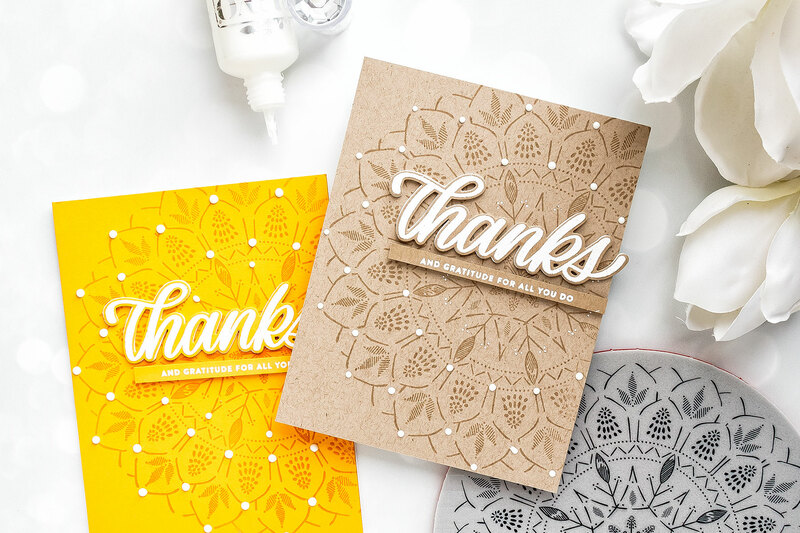 If you are a subscriber of my Youtube channel & blog and have been following my videos lately you might notice a pattern – I’m doing a lot of monochromatic tone on tone stamping and simple heat embossing these days. I just can’t help it – I love the look, I love the simplicity and and I adore end results. 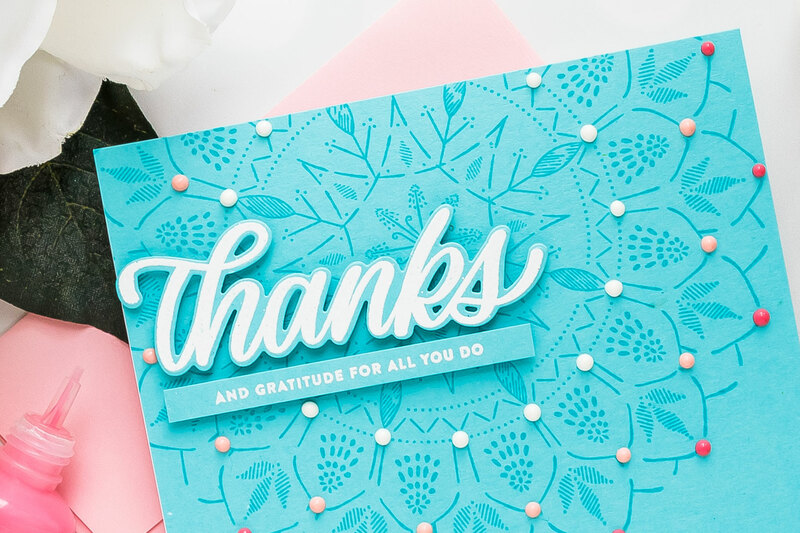 I used several colors of cardstock for my card – I just pulled a few colors from my stash and did watermark stamping, detail clear and detail white heat embossing. I used Sunshine, Sea Glass, Soft Navy cardstock from Simon as well as Desert Storm by Neenah. I was in need of thank You cards to I turned all of these backgrounds into quick and pretty much identical Thanks You. 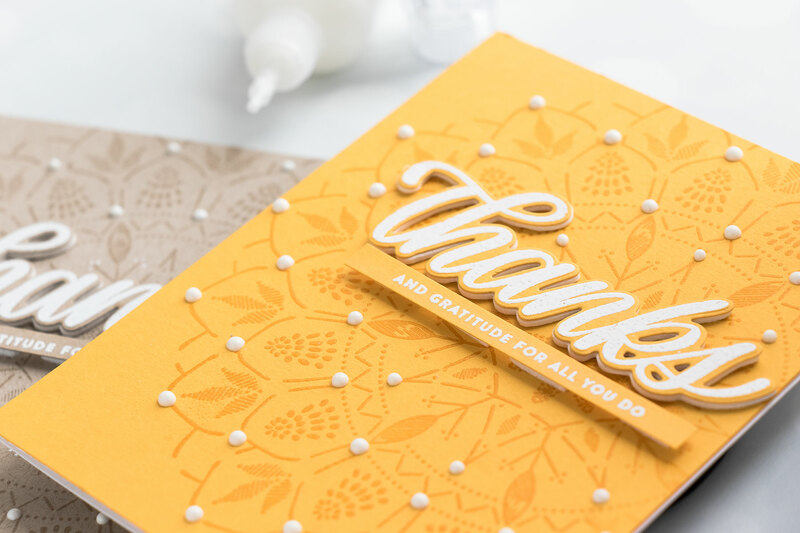 I used a stamp from the Big Thanks Words clear stamp set and heat embossed it in white onto coordinating color of cardstock. I didn’t have any Soft Navy cardstock left, so for that one I stamped it in Doll Pink onto white, but it doesn’t look quite as pretty when heat embossed in white. 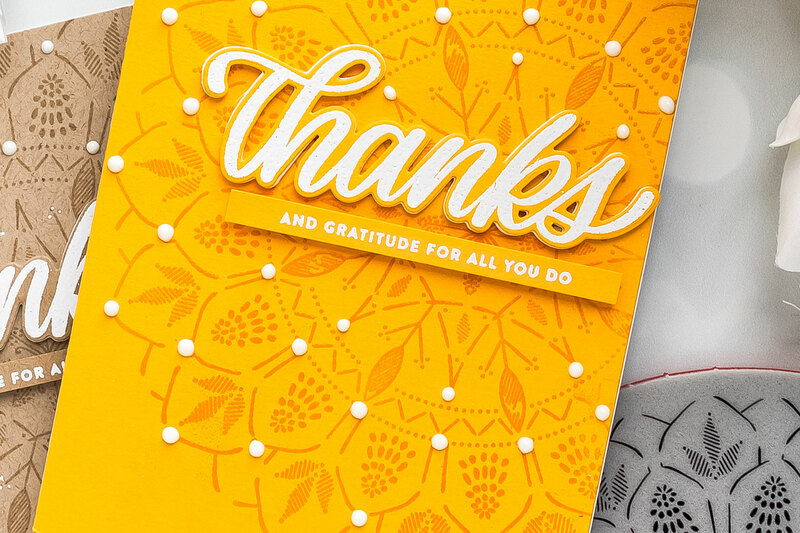 Next, I used a coordinating die and cut the Thanks Word out in my Spellbinders Platinum die cutting machine. I also used the same die to die-cut foam adhesive layer for my die cuts. Whenever I can I like to use fun foam and double sided sticky sheets to die-cut identical shapes out and use those shapes to foam mount my die cuts onto the card, especially word die cuts. Some people like to die cut them out of cardstock several times and glue cardstock die cuts together, I prefer to use fun foam instead. 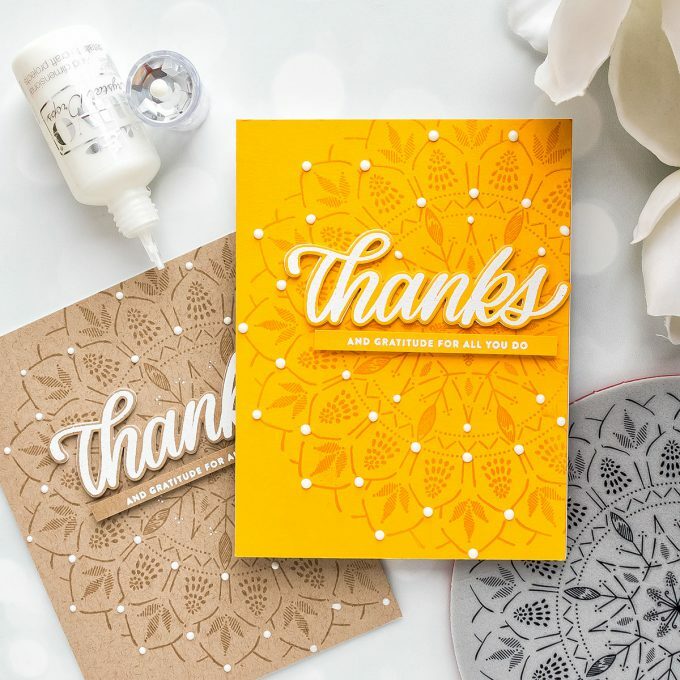 I also stamped and heat embossed an identical sub sentiment for all of my cards and it reads “And Gratitude For All You do” so together with the “Thanks” it forms a one meaningful sentiment. I cut it into a skinny strip and foam mounted onto the card under the large Thanks. 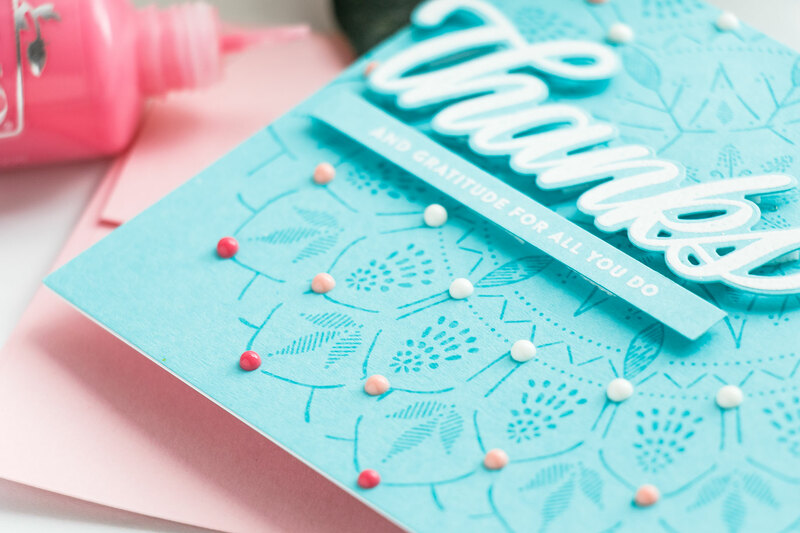 Finally, I wanted to add some additional texture and dimension to my cards so I used Nuvo Drops in various colors and I just added lots of little dots onto my background following the pattern of the lace. I used Carnation Pink, White and Bubblegum Blush. I love using my Nuvo Drops like this – they really help my backgrounds come to life and whats awesome about the drops is that I can make them in any size I like – they can be as small or as large as I want them to be. BLOG HOP – HOP ALONG AND GET INSPIRED! 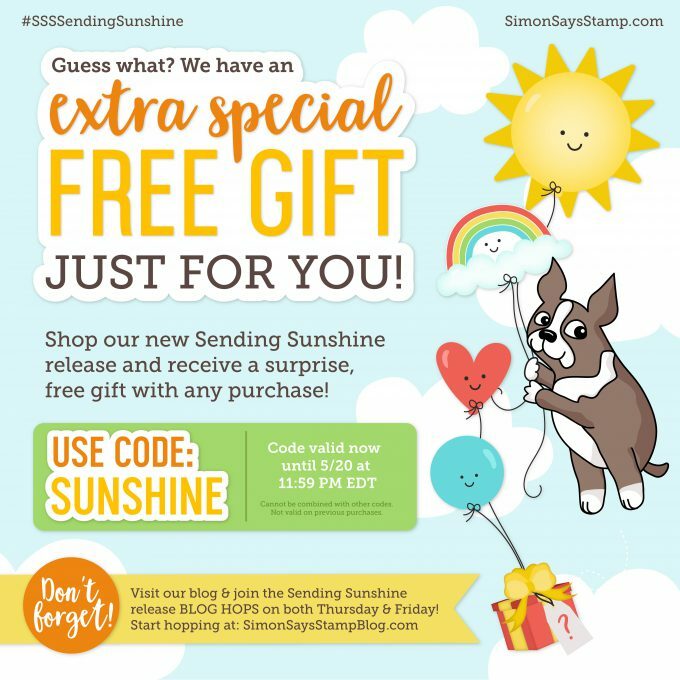 Simon is giving away a $25 coupon to every stop on the hop from blog comment section. Please leave a comment below to be entered into this giveaway. 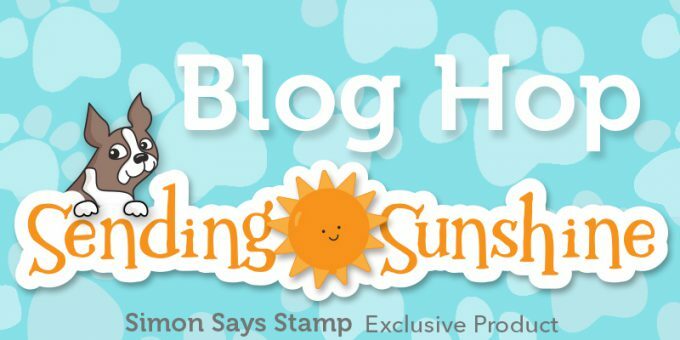 Winners will be posted on Simon Says Stamp store blog on Wednesday. Like this project? Save it to one of your boards on Pinterest for later! Such beautiful cards! I love the bohemiem background stamp! Tfs! LOVE your use of the Nuvo Drops!! All so very pretty, but the navy, pink and white is stunning! 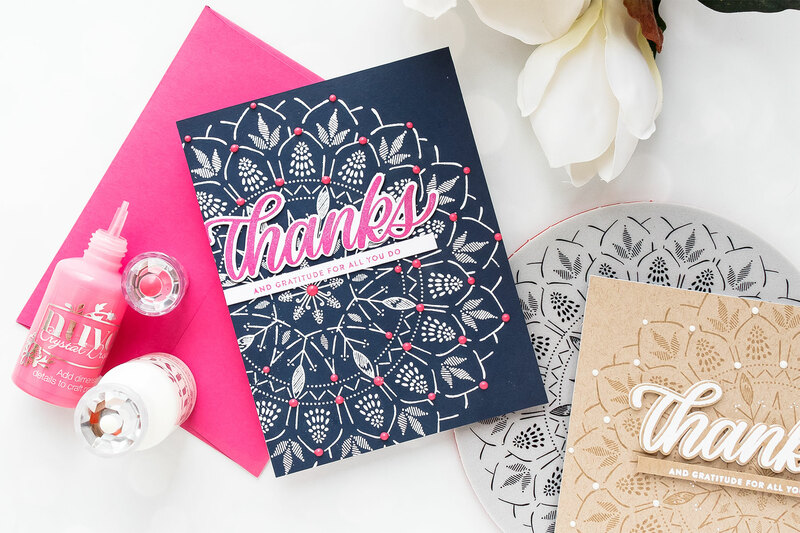 Thanks for sharing the Bohemian Lace stamp in so many colors. Love this stamp! 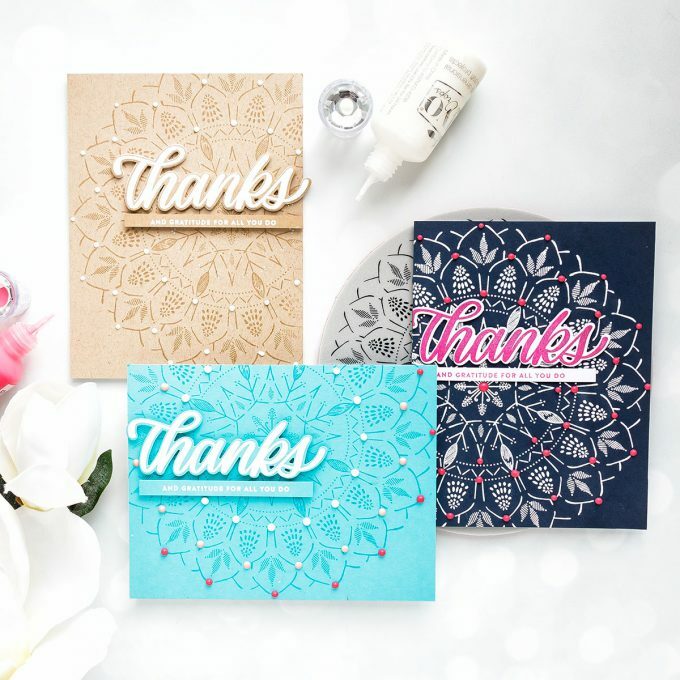 Wow….all of your cards are so striking….loved them all….the stencil is awesome…..I am loving this new collection release….so pretty…thank you so much…. Wow!! Absolutely stunning cards! I love this stamp so much. Thanks for the inspiration. Love the elegant look of these cards. Specially the navy with white combo! I love this stamp! Its so elegant and i like what you did with the Nuvo drops to make it stand out even more, brilliant! Such beautiful cards. You are always an inspiration. Such elegant cards! The tone on tone is beautiful! The bohemian lace is by far one of my favorites in this release. Thank you for showcasing it. These are beautiful designs. Love the results you get with the backgrounds you are creating! 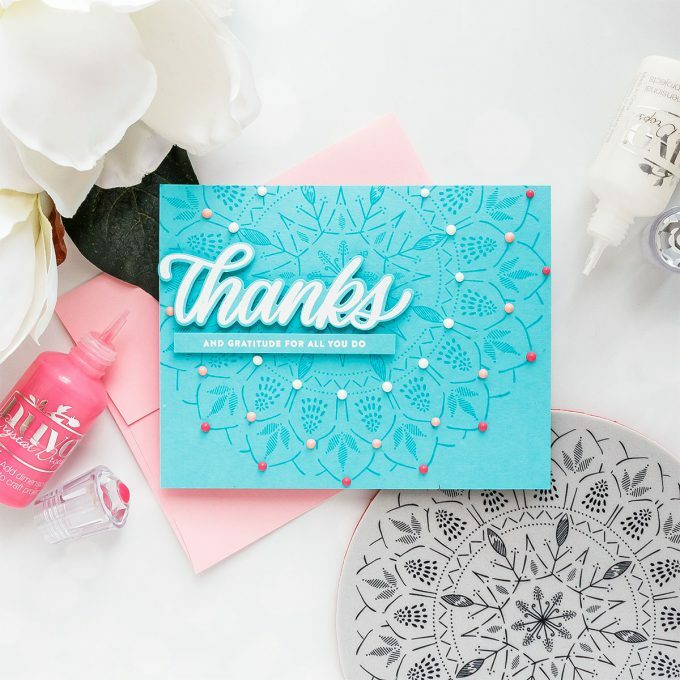 Gorgeous stamp and your card creations are amazing ! Thanks for sharing and thanks for great videos ! I love the tone on tone look, too! My favorite is the kraft card. You can never go wrong with that color! Love that beautiful background stamp! Gorgeous cards! 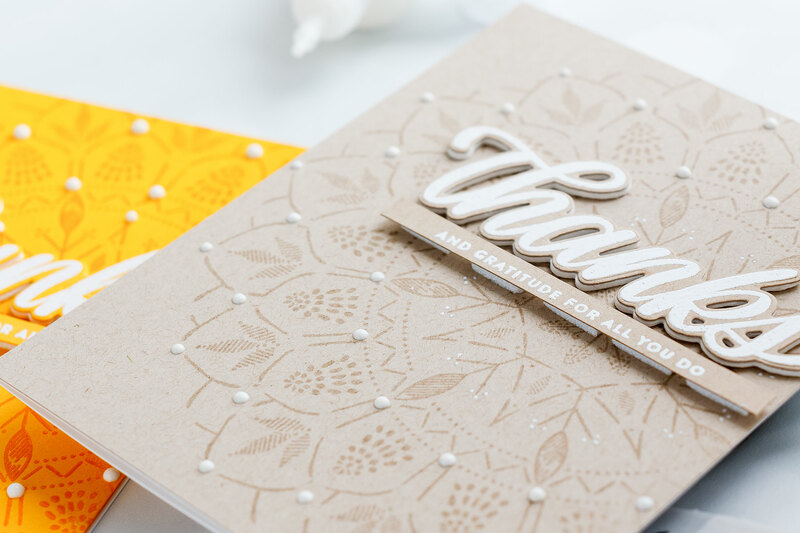 Love the easy and elegant style of these thank you cards! 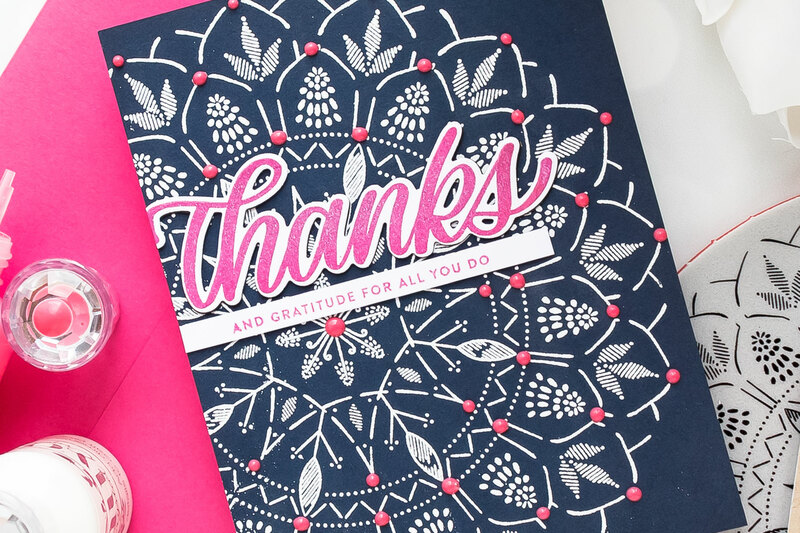 I like how you used the stamp to compliment many colors of card stock! Great idea and thank you for sharing!!!! Great simple and easy cards !! Yana these are absolutely stunning! I am especially in love with the white on dark one, so gorgeous! Wow, so beautiful! I love the nuvo drop accents. Oh my goodness Yana !!! You will always blow my mind with your incredible talent !!! Beautiful tone on tone stamping. 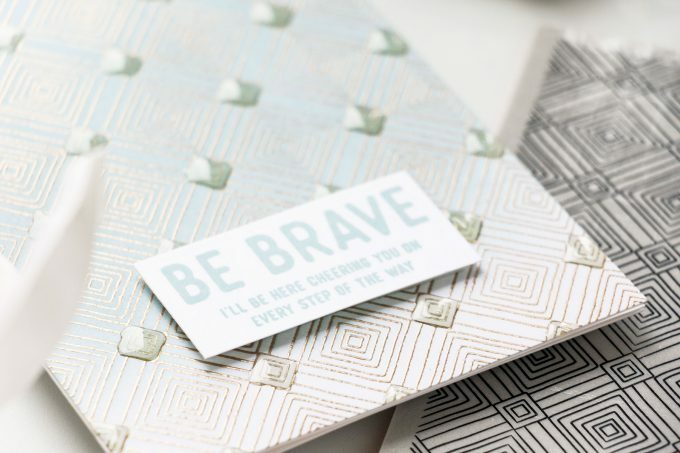 What inspiring cards, Yana! I love the new Bohemian Lace stamp. Pretty, pretty. Tone on tone. Love the cards, and that background stamp! Super elegant! 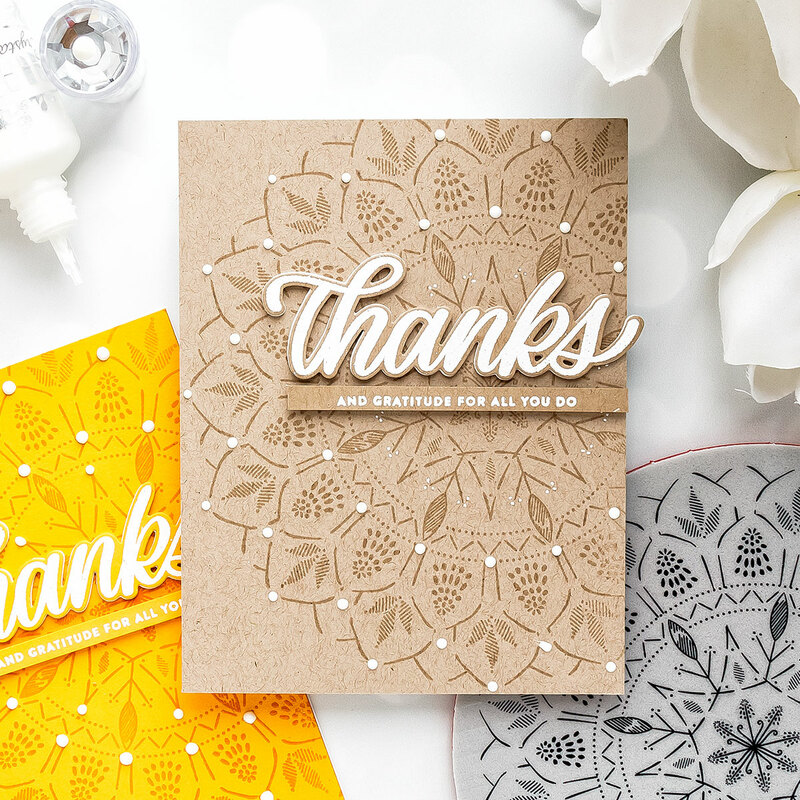 I love the Bohemian Lace background stamp and your beautiful tone-on-tone cards!